What’s your fine dining game like? Have you ever been at a fine dining establishment and felt intimidated by the dinnerware? Well BM this piece is for you! Dining rules were actually put in place to make you feel comfortable and to add a level of conformity to the dining experience. Depending on the restaurant, the waiter may place the napkin in your lap for you. If not, remove the napkin from the table, open it and place it on your lap. Always eat from your left and drink from your right. A simple way to remember this is to make the ok symbol with your fingers. Your left hand will create a “b” and your right will make a “d”: B for bread and D for drink. 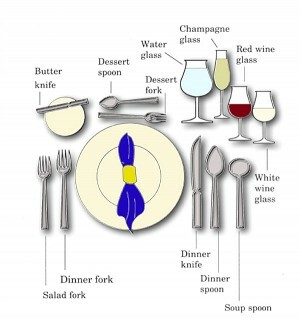 Always begin using the silverware from the outside in as the meal progresses. It’s that simple!! When finished your meal place your knife and fork at the eleven o’clock and five o’clock position. This will notify the waiter that you have completed your meal. Below are other key points that will allow you to operate with a fully competent etiquette in the finest of restaurants!! Start eating hot food when it is served, do not wait for everyone else to begin. For soup, dip the spoon into the soup, from the edge of the bowl to the center, moving away from you. Only fill it 3/4 full to avoid spilling. Sip, not slurp, from the edge of the spoon. Do not insert the whole bowl of the spoon into your mouth. It is proper to tip a soup bowl slightly to get all of the soup. Never turn the glass upside down to decline wine. It is more polite to let the wine be poured and not draw attention to yourself. If you are asked about wine and will not be drinking, quietly decline. Do not ask for a doggy bag unless it is an informal dining situation. Do not smoke at the table. Do not ask to taste someone else’s food. Similarly, do not offer a taste of your food to someone else. For hard to scoop items like peas, use your knife or a piece of bread to push the items onto your fork. Do not use your fingers. Cut only enough food for the next mouthful. If soup is too hot to eat, let it cool in the bowl. Do not blow on it. Practice good posture. If you are not eating, place your hand in your lap or rest your wrists on the edge of the table. Do not put your elbows on the table. If hot food is burning your mouth, discretely drink something cool to counteract the food. 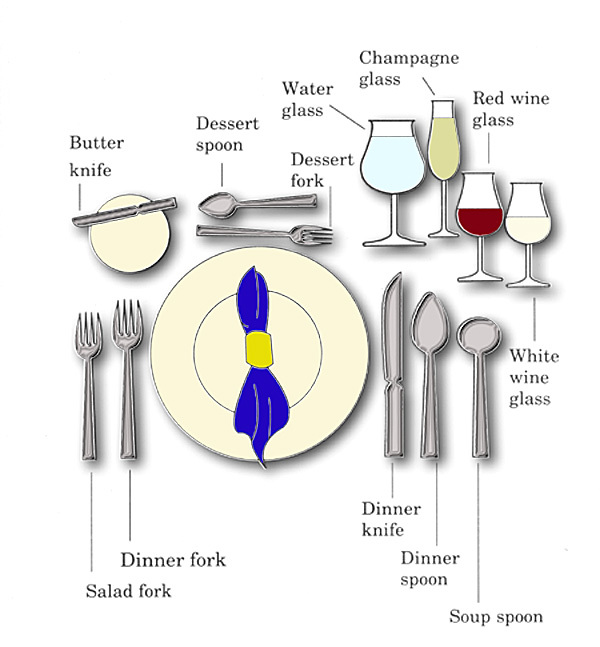 When dining out, order foods that can be eaten with utensils. Meeting materials or brief cases should be placed under your chair until it is time to discuss business. Try to pace your meal to finish at the same time as your host or the majority of the group at the table. Do not blow your nose at the dinner table. Excuse yourself to visit the restroom. Wash your hands before returning to the dining room. If you cough, cover your mouth with your napkin to stop the spread of germs and muffle the noise. If your cough becomes unmanageable, excuse yourself to visit the restroom. Wash your hands before returning to the dining room.